I do a ton of reading on the iPad these days, and though I use a number of different eBook readers, iBooks has gradually become my favorite – mostly because of its lovely vertical scrolling feature. Because I am spending more and more time in the iBookstore I have started occasionally sharing a notable new iBook that’s caught my attention. Today’s entry in that area is Hamlet: The Shakesperience. I can’t say I’ve ever been a keen student of Shakespeare, but a few of his works did draw me in – and Hamlet is certainly one of those. So this book (and its clever title) caught my eye. I installed it last night and have spent a little time with it – and it looks like a fantastic title for students and teachers. — Performance Audio: audio of some of the great performances of Hamlet embedded within the scenes. These include Sir Laurence Olivier, Sir John Gielgud, and Sir Derek Jacobi – who also provides introduction audio clips for each of the acts of the play. — Developed with leading Shakespearian scholars and ideal for students. I’m not sure I’ll end up reading all of this book, but I am seriously tempted to introduce my daughter to Shakespeare soon (she’s about to turn 10) and I feel sure this will be provide a great resource for all the many questions she’ll stump me with. 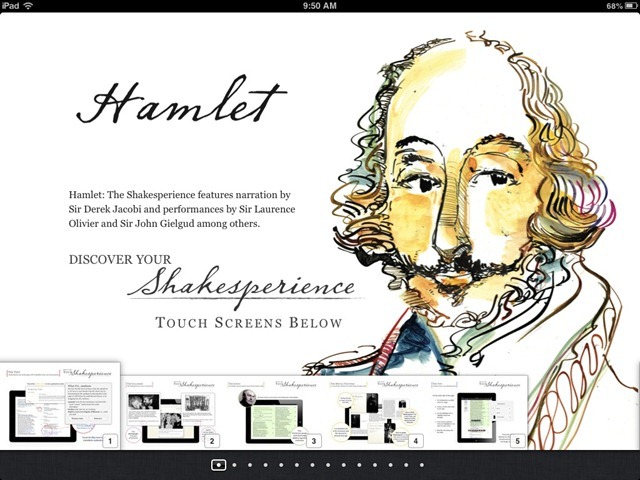 Here’s an iBookstore link for Hamlet: The Shakesperience; it’s priced at $5.99.